The Nashville Predators began an off season remake of their roster by trading Jason Arnott to the New Jersey Devils and Dan Hamhuis to the Philadelphia Flyers. In return, the Predators received forward Matt Halischuk and a second round pick in the 2011 draft for Arnott. Ryan Parent returned to the club that drafted him in 2005 in the swap for Hamhuis. While it was expected that Hamhuis would be departing the Predators as he entered unrestricted free agency, the trade of Arnott, the Predators captain over the past two seasons, came as a surprise. Arnott was entering the final year of a four year contract with the Predators and would have counted $4.5 million against the cap this season. Arnott was signed three years ago as a free agent from the Dallas Stars and had a no trade clause in his contract. According to General Manager David Poile, the conversation about moving Arnott began earlier in the season. Arnott gave a list of several teams to Poile that he would consider a trade, with New Jersey being one of the teams. It was at New Jersey that Arnott saw some of his best playing days. The highlight of his time with the Devils was scoring the double overtime game winner to clinch the Stanley Cup against the Dallas Stars in 2000. Arnott was a strong player for the Predators, but in the past two season had missed time due to some concussions, so his health and durability were becoming a looming concern. Hamhuis was drafted by the Predators and had matured into a solid defenseman. His play suffered from inconsistency at the start of the season, but settled down once paired with Cody Franson. 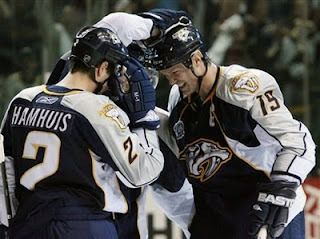 Hamhuis was an unrestricted free agent, and he made it no secret that he liked it here in Nashville. The question for Predators management would be the price that Hamhuis would command in free agency. While it was expected that Hamhuis would give the Preds a hometown discount, the fear was that the money offered by other teams would cause him to go to another team without the Predators receiving anything in return. By trading the rights to Hamhuis to Philadelphia and receiving Ryan Parent in return, the Predators were able to add back some depth to an already solid blue line. Parent was in the top six of the Philadelphia D corp, and it is expected that he will contend for playing time in Nashville. With the move of Arnott and Hamhuis, the Predators free up approximately $6.5 million in salary. This will be important as they begin negotiations with several restricted free agents. Patric Hornqvist, who had a breakout season last year, leading the Predators with 30 goals, is the most prominent of the players that GM David Poile has to sign. I would expect Hornqvist to get a bump to the $2 to 3 million range. Also in consideration will be restricted free agent Dennis Grebeshkov. Grebs had limited time with the Predators last season due to injury, but in his time on ice demonstrated offensive pop and he was sound defensively. Last season, Grebeshkov was paid $3.5 million, and I would expect his salary to be in that range again. Restricted free agent Cody Franson, a defenseman, is also due for an increase. He had a solid campaign last season and should land in the $1-1.25 million range. Another consideration for the Predators with the trade of Arnott is that another captain must be named. The consensus is that Shea Weber will wear the “C” next season. A powerful blueliner that leads by example both on and off the ice, he would be a natural choice to captain the Predators. Freeing up the salary of Arnott and Hamhuis leaves the Predators with some room to pursue other free agents, even after the considerations of signing the restricted free agents just mentioned. It is no secret that the Predators need to bolster their offense, so I would not be surprised to see the Predators make some additional moves at the onset of the free agency period. The Predators have already made some significant changes to remake the squad.